MOSSAR Color Guard Team on Veterans Day 2007. The team participated in the Veterans Day event located at the Liberty Memorial tower in Kansas City, MO, which honors World War I veterans. 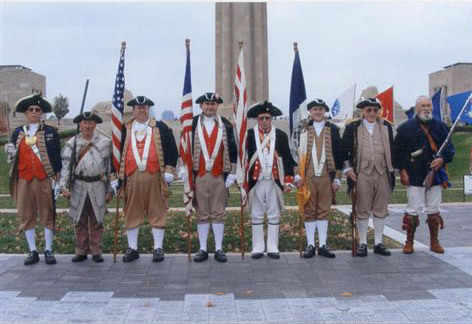 (L-R) Major General Robert L. Grover, MOSSAR Color Guard Commander; Compatriot J. Frank Shouse, Captain James L. Scott, Dirk A. Stapleton, Captain Russell F. DeVenney, Jr., Compatriot Kyle L. Kesler, Major General Fred Kaffenberger, KSSSAR Color Guard Commander; and Compatriot Francis R. Roberson Jr.